ArtJam is a monthly event that showcases a variety of live art such as musical performances, painting and tattooing. On the last Friday of every month, ArtJam by Good Vibe People presents local artists from all disciplines to perform in a creative atmosphere. Located at Nomad Live in the Mile-End, the first thing you notice when you walk through the doors is how vibrant the place is. The intriguing murals painted on the outside of the building carry you through the front doors and into a 10,000 square-foot space. Each edition presents a fresh lineup of artists who perform different forms of art, and brings something new and innovative to the event’s legacy. From 9 p.m. to 3 a.m., musicians take the stage, setting the mood for the night. While enjoying performances of all kinds, attendees can get tiny tattoos of their choosing, whether it’s of a pizza, or an elephant, or watch painters create an arrangement of works. ArtJam’s purpose is to unite a spectrum of creativity in the same space. The performances, which happen in the same large room, are simultaneously put on by artists with varying experiences. Here, attendees sometimes even take part of the performance, a show of collectivity. The event, which celebrates their twenty-eighth edition this April, has been rolling out in other North American cities including Brooklyn, Ottawa, and Sherbrooke. 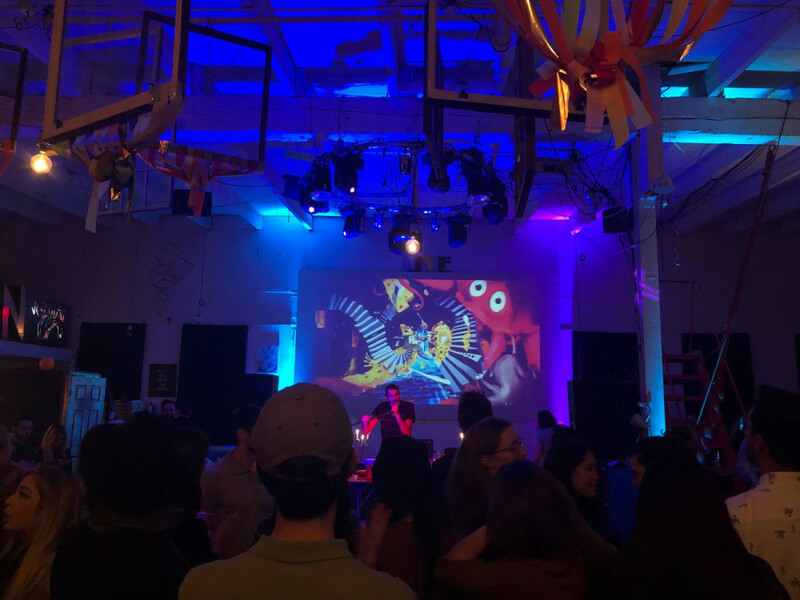 Nomad Live’s owner Jason Rodi explained that for a little over two years now, the ratio of artists at ArtJam is about five musicians, two tattoo artists, and five visual artists. With this, it leaves room for other forms of art to be showcased, and also provides consistency in the application selectees. 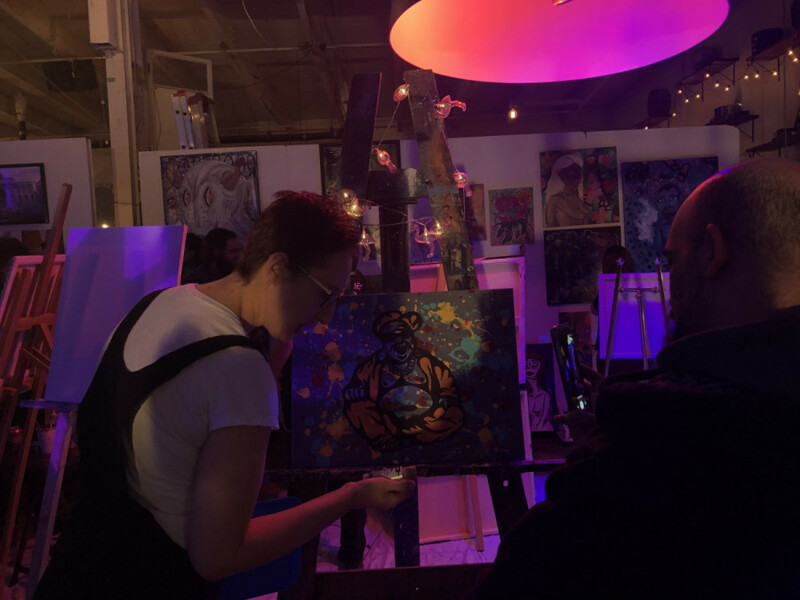 ArtJam differentiates from other events and galleries, as it aims to be a safe haven for local artists who may not have the same exposure as others. Like tattoo artist Kimberly Garcia, who just started her career 8 months ago. “It brings together artists that wouldn’t normally get to share their crafts so openly,” Garcia said. Ever since first attending the event, Garcia has made it her goal to tattoo at ArtJam whenever she got the chance. “I saw tattoo artists there before I even started and was blown away that they could keep evolving the event [every month],” said the Laval-based artist. For Rodi, a filmmaker and entrepreneur, each ArtJam is a success for him, as every month he has bands reaching out to him to perform at the event. Having several artists working in the same space in solidarity is important for him. “Doing things alone is not very interesting, you have to share things. And it is way more inspiring when you are surrounded by creative people,” Rodi said. Rodi decided to name the place Nomad because of he believes that every artist needs to be free. “Nomad is a synonym of possibility and freedom,” said Rodi. The word is also synonymous of the freelance artists he chooses to represent. This also expands to artistic freedom, which is at the foundation of the event. “Having all the different creatives in one room brings about an inspiring community that only makes you want to come back and experience the next edition,” said Garcia. ArtJam by Good Vibe People happens every last Friday of every month from 9 p.m. to 3 a.m. at Nomad Live //129 av. Van Horne // $10 presale and $15 at doors.